Cowboy Danny Boone—a name he made up one drunken night and has regretted ever since—harbors a big past and yearns for a small future. A short, bright career as a champion bull rider almost ended in his death when his homophobic father discovered Danny was gay. Now Danny longs for a plot of land he can build a ranch on, enough money to make up for some of the education he missed... and, secretly, a beautiful femme who likes to top—a combo rarer than a unicorn. This is the story of a sweet romance between two men from very different worlds. After he was attacked by his homophobic father, Danny assumed a new name and left the rodeo circuit to work on his friend Rand’s dude ranch. Laurie is a pampered interior decorator who arrives on the ranch with his rich boyfriend and a car full of designer luggage. Somehow, the rugged cowboy and the affluent city boy are drawn together during Laurie’s stay on the ranch. Set on Rand and Kai’s California ranch, the second book in this series has much of the same charm as the first. I enjoyed seeing Rand and Kai settled together and I love the way the kids have fit into life on the ranch. Danny is the quintessential cowboy fantasy. He’s good with horses, reserved with people, and loved by the tight knit family on the ranch. He keeps his difficult past a secret and he has learned the hard way to keep his sexuality quiet. In contrast, Laurie is out, proud, and he loves to flirt with traditional gender boundaries. It took me a while to warm to him. He is young, beautiful, and affluent and he loves to flaunt what he’s got. At the beginning, I couldn’t decide whether he was taking Grove for a ride. Events that happen during the story reveal a stronger character than I expected at the start and I quickly grew to love him. Laurie and Danny’s relationship is high angst from the start. Laurie’s dramatic, attention-seeking personality attracts, repels, and confuses Danny. And then there’s the boyfriend. And Laurie’s nefarious boss. His money problems. And his interfering mother. When Danny’s financial problems send him back to bull riding, he catches the attention of his father – which adds a whole new layer of drama. I loved the interactions between characters on the ranch, but Laurie and Danny spend most of the story apart. For me, there were moments when too much was happening to both men separately and I struggled to keep up with time and place. I didn’t completely follow the long time gap at the end, which didn’t make the resolution as satisfying as it should have been. I have a couple of reservations about this story, but this is still a really sweet, feel-good romance between two wonderful men. I really enjoyed this book. For reviews & more info, check out our Cowboys Don’t Come Out post. 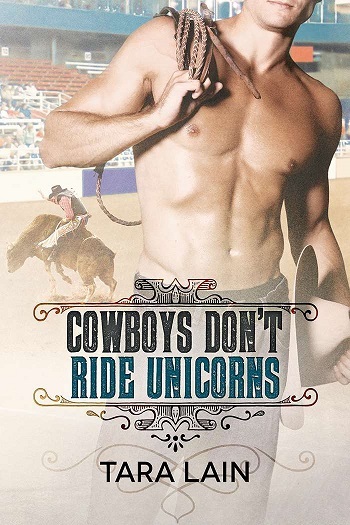 Reviewers on the Wicked Reads Review Team were provided a free copy of Cowboys Don't Ride Unicorns (Cowboys Don’t #2) by Tara Lain to read and review.